Meanwhile, in Elgin, a town that has a population 7 times larger than that of Dixon, only had 3 people who asked to get into drug rehab. None of those people have actually been placed in rehab. Lake County authorities have instituted a program called “A Way Out” in which the local police agencies in Lake County work together to place drug users in rehab. The program started about a year ago and a dozen people have been placed in rehab through this program. Efforts by local police agencies to attack the drug problem through drug treatment rather than criminal prosecution is in its early stages. These efforts are a way to tackle the drug problem through a different means. Whether or not these efforts will be successful or not remains to be seen. 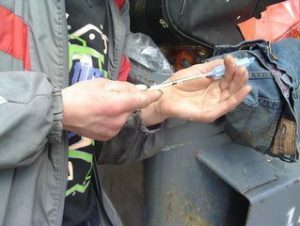 But more and more police agencies are instituting different programs to try to steer drug users into drug treatment rather than criminal court. Early results suggest that drug users who go through drug treatment in this way, do better than drug users who go through drug treatment under court order. The hope is that these efforts will do a better job of treating the root causes of drug crimes rather than steering people into the criminal justice system. James Dimeas is a nationally-recognized, award-winning, Kane County criminal defense lawyer. James Dimeas, has been handling Drug Crimes, Retail Theft cases, and Domestic Battery cases throughout Kane County, Chicago, Cook County, DuPage County, and Lake County for over 25 years. James Dimeas has been named a “Best DUI Attorney” and a “Best Criminal Defense Lawyer in Chicago” by Expertise. The National Trial Lawyers have named James Dimeas a “Top 100 Criminal Defense Trial Lawyer.” The American Society of Legal Advocates have named James Dimeas a “2018 Top 100 Lawyer.” AVVO has rated James Dimeas as “Superb”, the highest rating possible for any lawyer in the United States. If you are facing Drug Charges, Retail Theft Charges, or Domestic Battery Charges in Kane County, Chicago, Cook County, DuPage County, or Lake County, you can contact James Dimeas anytime for a free and confidential consultation. You can always talk to James Dimeas directly by calling him at 847-807-7405. Drug-Related Cases Remain a ‘Serious Issue,’ McMahon Says, by Susan Sarkauskas, The Daily Herald, July 13, 2017. Kane County State’s Attorney Says Level of Domestic Violence ‘Concerning’, by Dan Campana, The Aurora Beacon News, February 12, 2016. Police Programs That Help Drug Users Get Into Rehab Catching On, by John Keilman, The Chicago Tribune, July 23, 2017. New Bail Reform Law Creates Uncertainty in Kane County, by James G. Dimeas, Chicago Criminal Lawyer Blog, June 19, 2017.